Copyright Photo: Frontier Airlines (2nd) Airbus A320-251N WL N312FR (msn 7768) (Chocolate, the Moose) LAX (Michael B. Ing). Image: 940179. This entry was posted in Frontier Airlines (2nd) and tagged Airbus A320-251N WL, Frontier Airlines, Frontier Airlines (2nd), msn 7768, N312FR, Philadelphia on February 13, 2018 by Bruce Drum. Spirit Airlines (Fort Lauderdale/Hollywood) starting in April 2016, will begin new seasonal daily service between the Minneapolis-St. Paul International Airport (MSP) and the Boston Logan International Airport (BOS) and Philadelphia International Airport (PHL). Spirit’s new seasonal service between Minneapolis-St. Paul and Philadelphia will operate from April 14, 2016 through November 9, 2016, and between Minneapolis-St. Paul and Boston will operate from April 28, 2016 through September 7, 2016. This announcement follows Spirit’s recent announcement of new daily nonstop service between MSP and Atlanta’s Hartsfield-Jackson International Airport (ATL), also starting in April 2016. With these additions, Spirit will operate nonstop service from Minneapolis-St.Paul to 16 cities, including Atlanta (starting 4/14/2016), Baltimore/Washington DC, Boston (starting 4/28/2016), Chicago, Dallas/Fort Worth, Denver, Detroit, Fort Lauderdale/Hollywood, Fort Myers, Houston, Las Vegas, Los Angeles, Orlando, Philadelphia (starting 4/14/2016), Phoenix, and Tampa. Copyright Photo: Michael B. Ing/AirlinersGallery.com. Airbus A321231 N658NK (msn 6736) arrives in Los Angeles. This entry was posted in Spirit Airlines and tagged 6736, A321, A321-200, A321-231, Airbus, Airbus A321, Airbus A321-200, Boston, LAX, Los Angeles, Minneapolis/St. Paul, MSP, N658NK, Philadelphia, Spirit Airlines on December 18, 2015 by Bruce Drum. 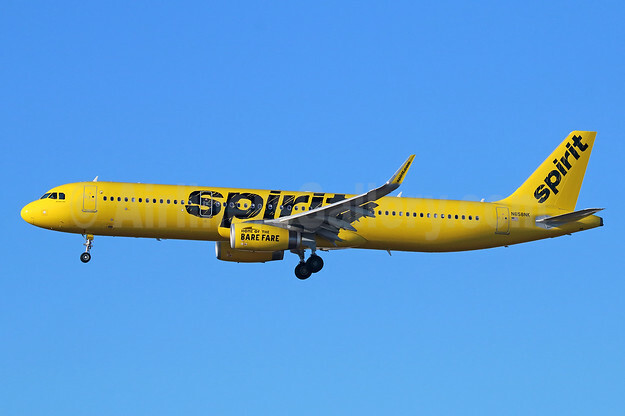 Spirit Airlines (Fort Lauderdale/Hollywood) starting on April 29, 2016, will begin new nonstop service from the Philadelphia International Airport (PHL) to the Detroit Metropolitan Airport (DTW) and the Fort Lauderdale-Hollywood International Airport (FLL). This announcement follows Spirit’s recent announcement of nonstop service between PHL and the Los Angeles International Airport (LAX), also starting in April 2016. With these additions, Spirit will operate nonstop service from Philadelphia to 8 cities, including Atlanta, Chicago, Dallas/Fort Worth, Detroit (starting 4/29/2016), Fort Lauderdale (starting 4/29/2016), Las Vegas, Los Angeles (starting 4/14/2016), and Myrtle Beach. Copyright Photo: Michael B. Ing/AirlinersGallery.com. Airbus A319-132 N505NK (msn 2485) departs from LAX. 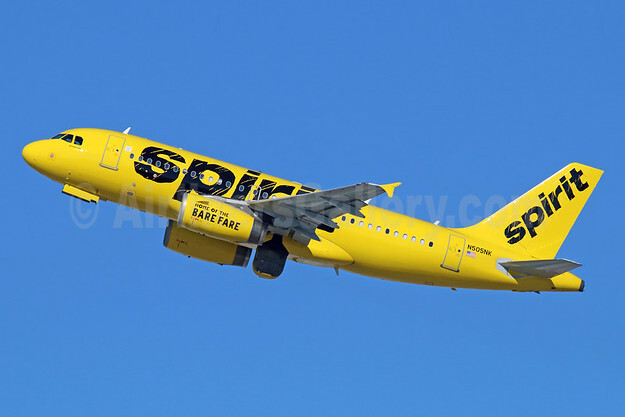 This entry was posted in Spirit Airlines and tagged 2485, A319, A319-100, A319-132, Airbus, Airbus A319, Airbus A319-100, Detroit, Fort Lauderdale/Hollywood, N505NK, Philadelphia, Spirit Airlines on December 10, 2015 by Bruce Drum. US Airways (American Airlines) (American Airlines Group) (Phoenix and Dallas/Fort Worth) is currently operating under a single AOC with American Airlines (Dallas/Fort Worth). However it has been using the US code for its flights. This will all end on October 16-17 when it operates a ceremonial last flight (flight US1939, named after the year All American Aviation started operations). The airline has announced the details of the last flight. Flight US1939 will operate on October 16 from Philadelphia to Charlotte, then on to Phoenix and San Francisco and then back to Charlotte arriving on October 17 at 0618. Tragically the last US flight will not touch Pittsburgh where it all started. Above Copyright Photo: Tony Storck/AirlinersGallery.com. US Airways Airbus A321-231 N578UW (msn 6035) now with “American” titles will be retained in the 2005 US Airways livery as the US Airways legacy aircraft. All American Aviation brings the first airmail service to many small western Pennsylvania and Ohio Valley communities with introduction of a unique ‘flying post office’ service. All American Aviation becomes All American Airways and makes the transition from airmail to passenger service with introduction of the DC-3 and an expansion of its service. Pacific Southwest Airlines begins operations with service in California. Above: Allegheny Airlines’ 1953 Route Map. 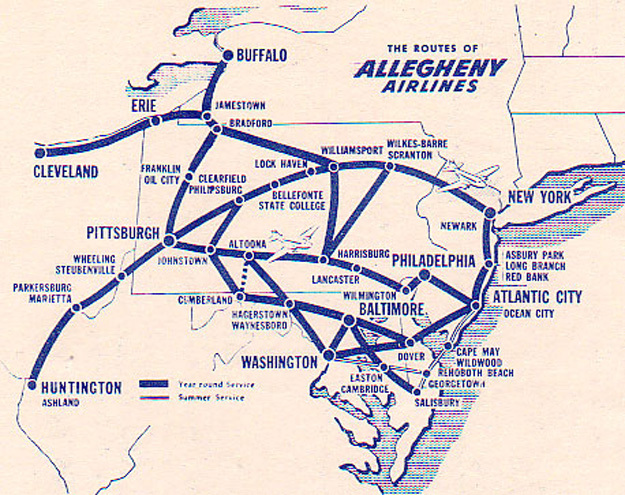 All American’s route system (above) grows and the name is changed to Allegheny Airlines, recognizing the mountains and river of the same name that lie in the heart of the airline’s network. Allegheny Airlines begins the transition to turbine-powered aircraft with introduction of the first Convair 580, its workhorse for the next several years. The first jet, a Douglas DC-9-14 (below), makes its debut in Allegheny colors. It is replaced the following year by the first of what would eventually become a fleet of 62 larger Douglas DC-9-31 jets (below). 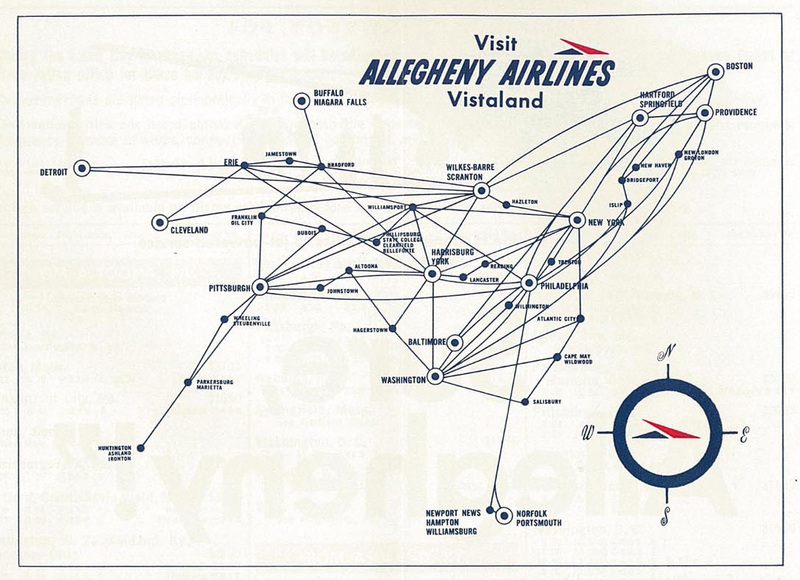 Above: Allegheny Airlines 1966 Route Map. The first Allegheny Commuter service begins, between Hagerstown, MD and Baltimore/Washington International Airport by Henson Aviation, forerunner of today’s Piedmont Airlines. It was the beginning of today’s network of 10 regional airlines that provide US Airways Express service to 172 cities throughout the nation. Above Copyright Photo: Christian Volpati Collection/AirlinersGallery.com. Nord 262A-12 N26203 (msn 13) of Lake Central Airlines. Allegheny merges with Indianapolis-based Lake Central Airlines, expanding the growing route network beyond Pittsburgh to the Midwest including Dayton, Columbus and Cincinnati, OH; Indianapolis, IN; and St. Louis, MO. Allegheny acquires Mohawk Airlines, a Utica, NY airline with service to most cities throughout New York and New England. With the merger, Allegheny acquired Mohawk’s BAC 1-11 jets to complement its DC-9s and becomes the sixth largest airline in the world as measured by passenger boardings. Above Copyright Photo: Bruce Drum/AirlinersGallery.com. Mohawk’s Fairchild-Hiller FH-227B N7819M (msn 542) carries an additional Allegheny sticker at Syracuse. Deregulation comes to the U.S. airline industry. Airlines have new freedom to expand their route systems and more flexibility to develop new and innovative pricing structures, but lose the protection of the fare- and route-setting authorities exercised by the Civil Aeronautics Board, which closes down by 1984. Allegheny changes its name to USAir to reflect its expanding network, including post-deregulation entry into Arizona, Texas, Colorado, Florida and later, California. 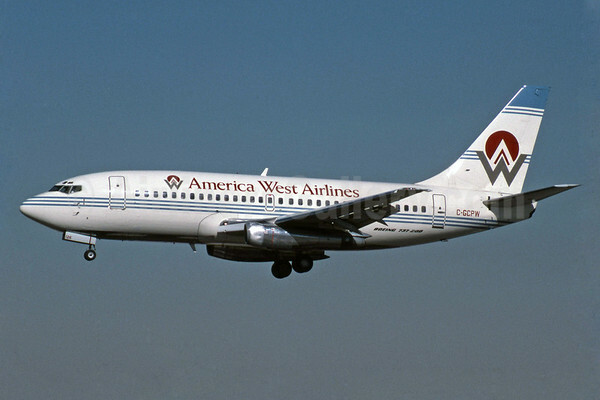 America West Airlines begins operations in Phoenix on August 1 with 230 employees and three Boeing 737-200s, serving Colorado Springs, CO; Kansas City, KS; Los Angeles, CA; and Wichita, KS. The airline’s schedule calls for 20 daily departures. Above Copyright Photo: Jay Selman/AirlinersGallery.com. Leased Boeing 737-275 C-GCPW (msn 20959) of America West Airlines in the original 1983 livery lands at Las Vegas. 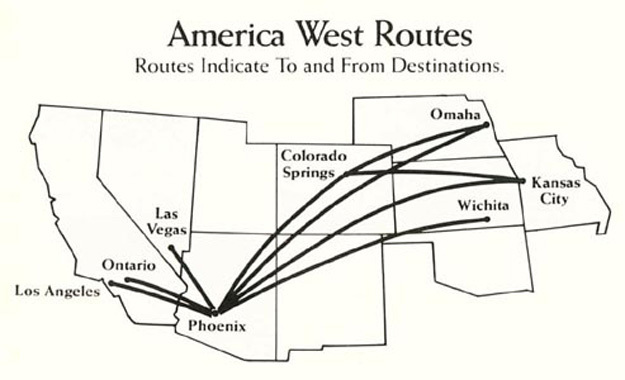 Above: The original 1983 route map for America West Airlines. USAir introduces its Frequent Traveler program, which provides travel benefits to USAir’s most loyal customers. Piedmont acquires Empire Airlines and its Syracuse, NY hub. Above Copyright Photo: Bruce Drum/AirlinersGallery.com. Empire Airlines (2nd) Fokker F.28 Mk. 4000 N110UR (msn 11182) taxies from the gate at the Syracuse hub. Large-scale airline consolidation, a partial product of deregulation, continues. 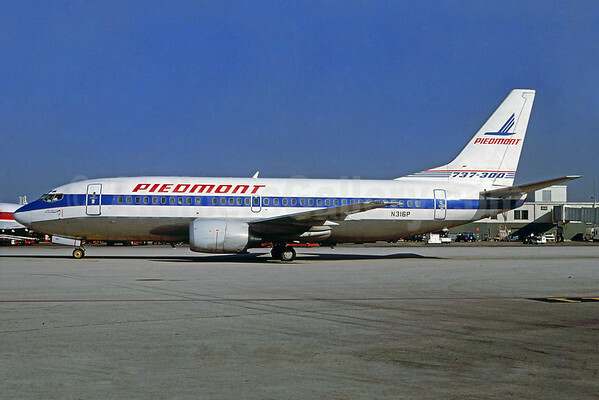 Piedmont Airlines introduces European routes in its system. Competition for the lucrative California market intensifies as local carriers are bought and merged into larger partners. Pacific Southwest Airlines of San Diego becomes a wholly-owned subsidiary of USAir Group in May. 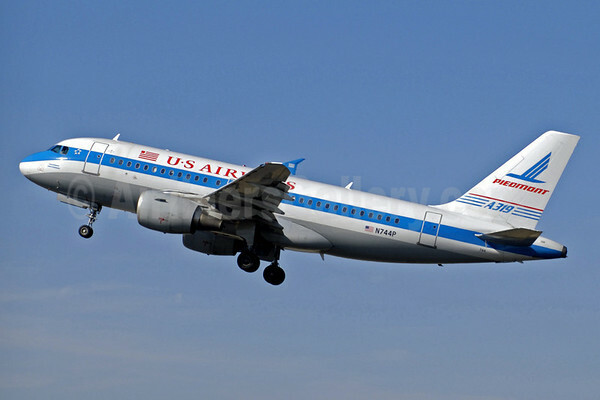 Piedmont Airlines, the dominant carrier throughout the mid-Atlantic region of the United States, also becomes a subsidiary of USAir Group in November 1987. PSA is merged into USAir. Above Copyright Photo: Bruce Drum/AirlinersGallery.com. PSA’s BAe 146-200 N384PS (msn E2024) taxies to the runway at San Jose, California. Above Copyright Photo: Bruce Drum/AirlinersGallery.com. Boeing 737-301 N316P (msn 23234) taxies at Miami. Piedmont Airlines is integrated into USAir, the largest merger in airline history. The merger brings with it Piedmont’s international routes as well as its Charlotte, Baltimore, Dayton and Syracuse hubs. Baltimore and Charlotte remain hubs. The merger also brings USAir’s first wide body jets, the Boeing 767-200 ERs now used on its transatlantic and some transcontinental routes. Above Copyright Photo: Bruce Drum/AirlinersGallery.com. Boeing 767-2B7 ER N651US (msn 24764) taxies to the gate at MIA dressed in the 1989 color scheme. USAir expands its international flying with service between Pittsburgh and Frankfurt, Germany, complementing existing Charlotte-London service begun in 1987 by Piedmont; and in 1991, international expansion continues with the introduction of new nonstops between Charlotte and Frankfurt. Philadelphia-Paris is added to USAir’s transatlantic schedules in January. Daily nonstops between both Philadelphia and Baltimore/Washington International Airport and London Gatwick Airport are introduced in May. 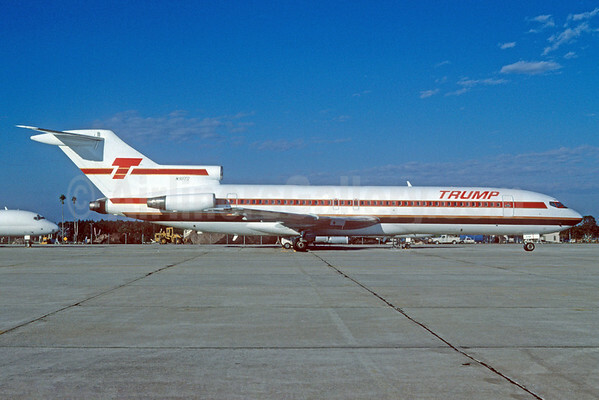 USAir and Trump Shuttle begin a marketing affiliation under which the service becomes the USAir Shuttle. The Shuttle provided hourly service between New York and Boston and between New York and Washington, DC. Above Copyright Photo: Denis Goodwin – Bruce Drum Collection/AirlinersGallery.com. USAir’s new terminal at New York LaGuardia opens, as does the new Midfield Terminal at Pittsburgh International Airport. USAir and British Airways announce an investment/alliance plan, under which USAir gives up its London route authority. USAir posts its first profitable year since 1988, with earnings of $119.3 million on sales of $7.474 billion. USAir introduces Priority TravelWorksSM, allowing bookings from personal computers. Stephen M. Wolf is elected chairman effective January 22. Seth E. Schofield retires as chairman after 38 years’ service to the company and three and a half years and chief executive. USAir continues its transatlantic expansion, winning the right to serve Munich, Rome and Madrid from Philadelphia beginning in 1996. USAir introduces ticketless travel. USAir, in a dramatic two-week period, announces what might in time be the largest single order for airliners; then announces a new name, image, identity designed to carry the airline aggressively into the next century. The airline ordered up to 400 new Airbus A319, A320 and A321 narrowbody twin jets for delivery starting in 1998 and continuing through 2009; then within days announced its new identity as US Airways. Above Copyright Photo: Bruce Drum/AirlinersGallery.com. Boeing 757-2B7 N940UW (msn 27805) displays its new dark blue 1997 livery which tended to fade. The airline challenged its relationship with British Airways in court, seeking rights to London Heathrow from four U.S. gateways and to require British Airways to dispose of its USAir stock. 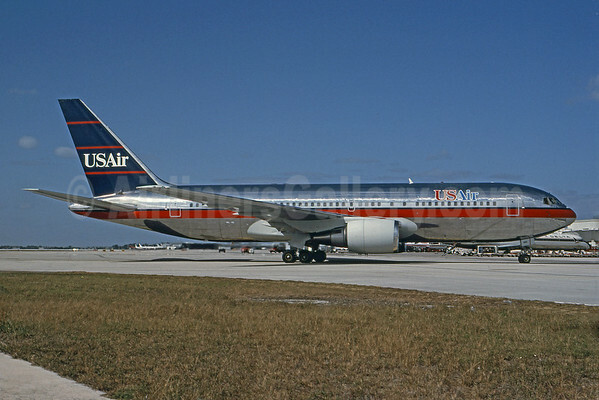 USAir notifies BA the codeshare between the two will end in March, 1997, and in December, British Airways announces it will sell its shares in USAir and that its three directors will resign. The name US Airways is put into use officially on February 27. Signs, stationery, ticket stock, business cards, advertisements, marketing materials, ticket folders and counters all start to sport the new US Airways blue, red, gray and white identity, and the first aircraft are painted in the new scheme as the changeover approaches. The US-BA codeshare expires in March. Above Copyright Photo: Bruce Drum/AirlinersGallery.com. Ex-Trump Shuttle Boeing 727-225 N918TS (msn 20445) now wears US Airways Shuttle titles. US Airways Inc., purchased Shuttle Inc., from a consortium of banks. The Shuttle has flown under the US Airways name since 1992, when US Airways became an investor in the Shuttle with a minority ownership stake. US Airways Shuttle flies 17 daily roundtrips between Boston and New York LaGuardia, and 16 daily roundtrips between New York LaGuardia and Washington Reagan. 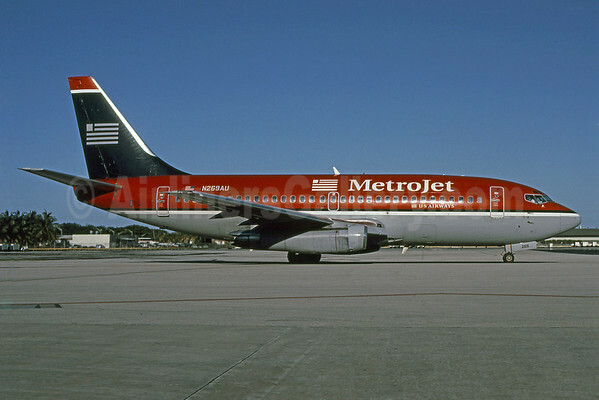 MetroJet by US Airways starts service, providing the airline with a low-fare unit to compete in the eastern United States. MetroJet’s single-class, using Boeing 737-200 aircraft, proves highly popular. Above Copyright Photo: Bruce Drum/AirlinersGallery.com. Boeing 737-2B7 N269AU (msn 22881) displays the unique red fuselage 1998 livery. Above: MetroJet routes in 2000. US Airways Express introduces regional jets to its system. US Airways fleet transformation begins with the introduction of the first of as many as 400 Airbus A320-family aircraft. 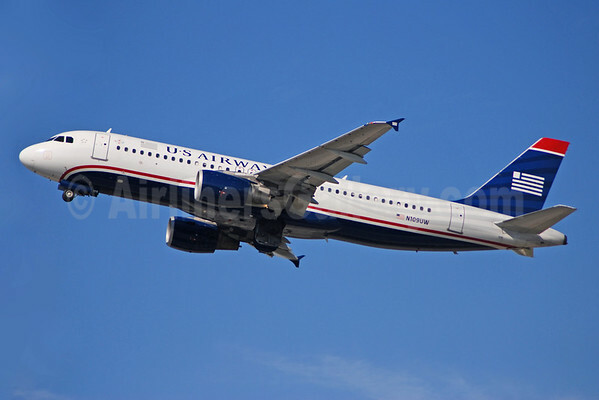 US Airways first Airbus A320 aircraft enters service with scheduled daily flights between Philadelphia and Los Angeles. The new 142-seat A320 is part of the US Airways plan to simplify and modernize the fleet by adding Airbus A319, A320 and A330-300 aircraft. US Airways expands its international route network by adding nonstop service between its Charlotte, NC hub and London Gatwick. Charlotte becomes the third US Airways transatlantic gateway. Colgan Air, Inc. joins the US Airways Express nine-carrier network, expanding service to destinations across the East Coast from Bar Harbor, ME to Atlanta, GA. The fleet transformation continues with A320-family aircraft arriving at a rate of one per week in the second half of the year. 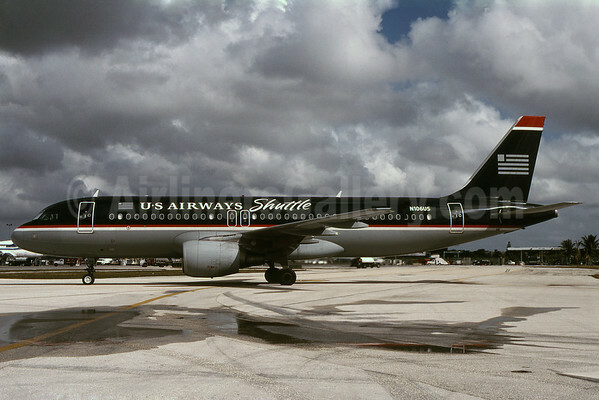 The US Airways Shuttle begins its transformation to an all A320 fleet (below), retiring the venerable Boeing 727s. Above Copyright Photo: Bruce Drum/AirlinersGallery.com. Airbus A320-214 N106US (msn 1044) for a short time wore US Airways Shuttle titles. This A320 would later be ditched in the Hudson River. US Airways unveils its enhanced and redeveloped website, usairways.com, originally launched in 1996, offering customer-friendly features that include a streamlined process for checking fares, making reservations, purchasing tickets, checking flight status and accessing Dividend Miles account information. The site begins drawing more than 600,000 visitors a week. US Airways begins service to its eighth European destination with the introduction of Philadelphia-Manchester, UK service. US Airways opens an international reservations center in Liverpool, UK. Above Copyright Photo: Bruce Drum/AirlinersGallery.com. Boeing 737-301 N350US (msn 23553) wore this unique “No booking fees No brainer” livery to promote the new website. US Airways takes delivery of its first Airbus A330-300 widebody aircraft, making the next step in its fleet transformation. Six A330s will enter the fleet by the end of the year. Copyright Photo: Bruce Drum/AirlinersGallery.com. Airbus A330-323 N276AY (msn 375) prepares to land at the Charlotte hub. US Airways becomes the first carrier to fly the 169-seat Airbus A321. In addition to a common cockpit, which vastly simplifies pilot training and scheduling, US Airways’ A320-family aircraft also have common cabin fittings, such as seats, overhead bins, galleys and lavatories, simplifying cabin service and maintenance. David N. Siegel takes over as US Airways president and CEO in March, naming other new members of the senior management team over the next several months and undertaking a proactive restructuring plan for the company. 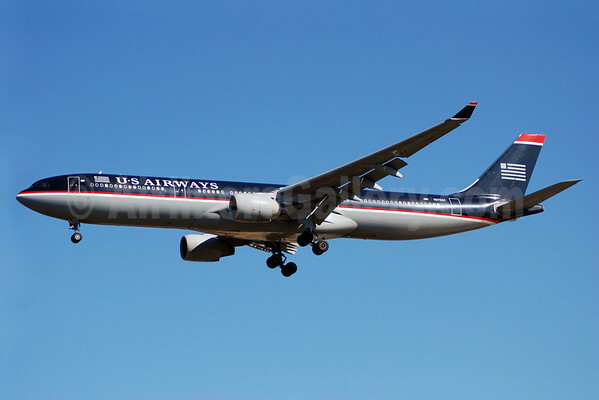 As part of the restructuring, US Airways enters Chapter 11 bankruptcy reorganization on August 11, with the stated goal to emerge as a leaner, more competitive carrier in March 2003. US Airways begins implementation of a codeshare agreement with United Airlines, introducing customers of both airlines to more than 3,000 codeshare flight segments in the first half of the year, reciprocal airport club use and simplified ticketing and baggage procedures. Midway Airlines joins the US Airways Express ten-carrier network, bringing expanded regional jet service to destinations such as Jacksonville, FL and Myrtle Beach, SC. US Airways joins the Star Alliance network, an alliance of member airlines that share networks, lounge access, check-in services, ticketing and other services. US Airways Group, Inc. files again for reorganization under Chapter 11 of the United States Bankruptcy code on September 14, seeking to restructure operating costs in light of ever-increasing fuel prices and cutthroat industry competition. America West Holdings and US Airways Group, Inc. announce plans to merge on May 19. Former America West Airlines Chairman and Chief Executive Officer Doug Parker is chosen to run the combined airline. 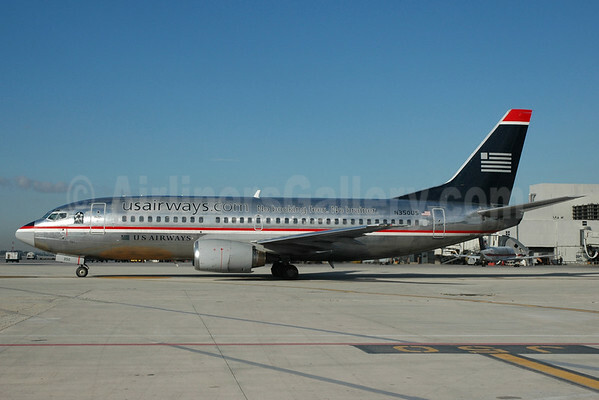 In August, America West and US Airways unveil the livery that will appear on the aircraft of the new US Airways. Employees of both airlines, some sporting ‘retro’ uniforms heralding back to various periods in the airlines’ pasts, celebrate the new paint scheme as a freshly painted Airbus A320 makes its way across the country, stopping for special events with union leaders of both airlines. Above Copyright Photo: Bruce Drum/AirlinersGallery.com. Airbus A320-214 N109UW (msn 1065) departs from Fort Lauderdale-Hollywood International Airport in the 2005 livery. 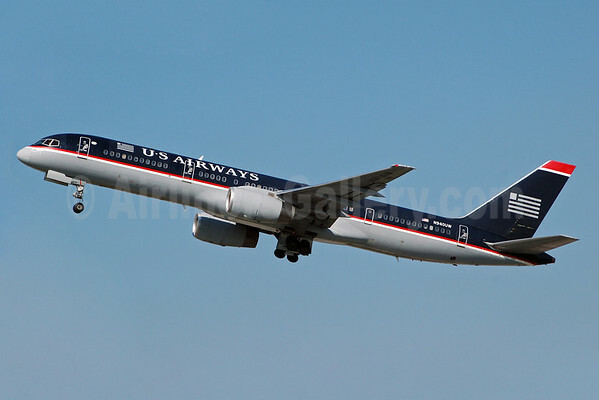 The merger transaction is officially complete on September 27, and US Airways Group, Inc. is no longer in bankruptcy. Stock of the merged airline begins trading on the New York Stock Exchange under the LCC ticker symbol. Throwback liveries are dedicated mirroring the schemes of PSA, Piedmont, Allegheny and America West. Events are held in the progenitor airlines’ hub cities. The airline posts profits for both the first and second quarters of the year, surpassing analyst expectations and contributing tens of millions of dollars to employee profit sharing programs. The airline employs more than 35,000 aviation professionals and its route map encompasses 3,800+ daily flights serving 239 destinations and 28 countries/territories. Above Copyright Photo: Jay Selman/AirlinersGallery.com. Airbus A319-112 N744P (msn 1287) departs from Charlotte in the legacy Piedmont livery. US Airways agreed to add seven Airbus A330-200s to the airline’s widebody fleet to be used to support the airline’s international growth plans. The airline obtained a single operating certificate from the FAA, hired a new Chief Operating Officer (COO), Robert Isom, and announced plans to build a new 60,000-square-foot flight operations control center in Pittsburgh. US Airways inaugurated its first-ever service to London Heathrow from its international gateway in Philadelphia. US Airways also announced plans to operate year-round, daily nonstop service to Tel Aviv from Philadelphia, scheduled to begin July 2009. US Airways announced three new transatlantic flights to begin spring 2009: Birmingham, UK and Oslo, Norway from Philadelphia; and Paris Charles de Gaulle from Charlotte. Transatlantic flights in 2009 will total 27 daily flights to 23 destinations. US Airways successfully activated the airline’s new, state-of-the-art Operations Control Center in Pittsburgh where all flight control and dispatch functions for US Airways’ 1,300 daily mainline flights are carried out. On January 15, the crew of flight 1549, bound from New York LaGuardia to Charlotte successfully ditched their crippled aircraft in the Hudson River. All 155 passengers and crew survived. US Airways was awarded and began year-round service from its Charlotte hub to Rio de Janeiro, resumed its Charlotte to Paris service and began service from Charlotte to Rome. Also in 2009, the airline began nonstop flights from Philadelphia to Tel Aviv and from Phoenix to Montego Bay. During the year, the airline entered into codeshare agreements with Qatar Airways, ANA and TACA. In the third quarter US Airways announced an airport slot transaction with Delta Air Lines. Upon regulatory approval, US Airways will obtain 42 pairs of slots (roundtrip flights) at Washington Reagan and will acquire the rights to expand to Sao Paulo and Tokyo. US Airways will transfer to Delta 125 pairs of slots used to provide US Airways Express service at New York LaGuardia. US Airways also announced that, once the transaction is complete, the airline would provide service to 15 new destinations from Washington Reagan. The airline announced that the transaction is expected to improve profitability by more than $75 million annually. 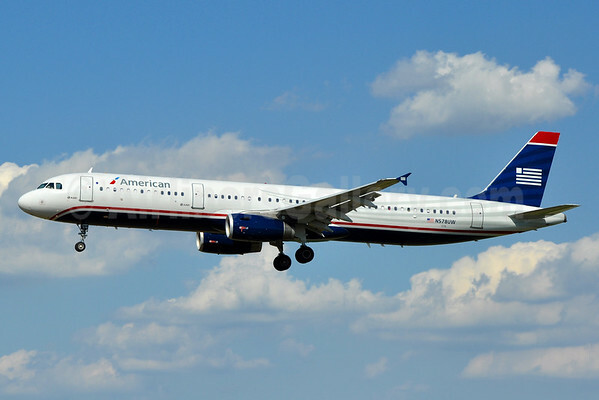 In October, US Airways announced a strategic plan to strengthen its core network by realigning its operational focus on its hubs in Charlotte, Philadelphia and Phoenix and its focus city Washington, DC. These four cities, as well as the airline’s hourly Shuttle service between New York LaGuardia, Boston and Washington Reagan will serve as the cornerstone of the airline’s network and will present 99 percent of the airline’s available seat miles, compared to the 93 percent in 2009, by the end of 2010. In March, the airline launched wireless internet through Gogo® Inflight Internet on five of its Airbus A321 aircraft, with the remaining fleet of A321 aircraft outfitted by June. Gogo allows passengers to use their laptops or Wi-Fi enabled mobile devices to access the web, email, log in to corporate Virtual Private Networks (VPN) and access online entertainment options. In May, Delta and US Airways announced a new agreement to transfer takeoff and landing rights at New York’s LaGuardia and Washington D.C.’s Reagan National airports, which will enable Delta and US Airways to expand service and increase competition at two of the nation’s key cities, and provide the opportunity for additional access to LaGuardia and Reagan National for new entrants and airlines with a limited presence at the airports. Under the agreement, Delta would acquire 132 slot pairs at LaGuardia from US Airways and US Airways would acquire from Delta 42 slot pairs at Reagan National and the rights to operate additional daily service to Sao Paulo, Brazil in 2015, and Delta would pay US Airways $66.5 million in cash. In addition, the airlines will divest 16 slot pairs at LaGuardia and eight slot pairs at Reagan National to airlines with limited or no service at those airports. The completion of the transaction is subject to certain closing conditions, including government and regulatory approvals. A slot pair is the authority to operate one takeoff and one landing. Also in July, the Department of Transportation (DOT) tentatively approved the proposed slot transaction, announced in May, at New York-LaGuardia and Washington-Reagan National airports. In October, Delta Air Lines and US Airways welcomed the decision by the Department of Transportation to approve the proposed slot transaction at New York-LaGuardia and Washington-Reagan National airports, subject to certain conditions. The DOT’s final order represents a clear recognition by the Obama Administration that the slot transaction is in the public interest because of the service benefits and efficiencies that would result in both New York and Washington, D.C. US Airways: A Heritage Story. By William Lehman. Founded in 1937, Allegheny Airlines started its life as All-American Airways. Like several other airlines, it began by carrying airmail for the United States Post Office. All-American started airmail service on March 12, 1939, using the single-engine Stinson Reliant aircraft serving several small communities in western Pennsylvania and the Ohio valley. All-American crafted a unique tail-hook, which hung beneath the aircraft to pick up the cloth mail bags, using the same techniques that the railroads had developed in the late 19th century. After the end of World War II, with a huge surplus of military aircraft that could quickly be converted to carry passengers, the Civil Aeronautics Board started getting swamped with applications from the airmail carriers to be allowed to carry passengers. All-American was no exception, which was now designated as a local-service airline. The C.A.B. issued All-American a three-year temporary certificate to carry passengers in January 1949; however, passenger service did not begin until March 7, 1949, using a recently acquired Douglas DC-3 which was configured to carry 24 passengers, 2 pilots, and a stewardess. The C.A.B.’s authority for All-American covered Maryland, New York, Ohio, the District of Columbia, and Pennsylvania. Above Copyright Photo: Jacques Guillem Collection/AirlinersGallery.com. Allegheny Airlines’ Douglas C-47A-DL (DC-3) N151A (msn 9471) is pictured in the 1953 “boomerang” livery. On January 1, 1953, All-American officially became Allegheny Airlines, with 13 DC-3’s making up the fleet. As the 1950’s marched on, Allegheny’s growth continued, but the DC-3’s were limited in range. Allegheny needed another type of aircraft that was capable of flying farther. At the same time, two airlines – California Central and Pioneer Airlines – put several used Martin 202 aircraft that had flown earlier for TWA and Northwest Orient Airlines up for sale. Acquiring the Martin 202’s became the focus of Allegheny’s expansion plans. Above Copyright Photo: Christian Volpati Collection/AirlinersGallery.com. Martin 202 N172A (msn 9142) rests between flights in the first livery worn by the Martins. The first Martin 202 began service with Allegheny on June 1, 1955. The Martin 202, like the DC-3, was unpressurized, but the “Martin Executive”, as they were called, quickly became a favorite among businessmen. 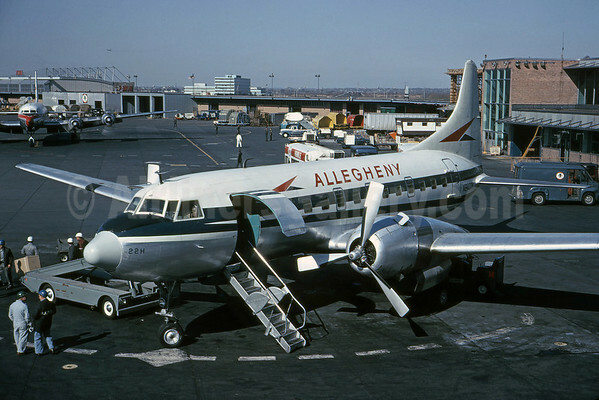 On January 1, 1956, Allegheny was issued a permanent certificate to carry passengers by the C.A.B. By now, Allegheny had expanded to sixty cities with a fleet of 14 DC-3’s and 5 Martin 202’s; the airline was so happy with the performance and range of the Martin 202 that it would eventually acquire and operate a total fleet of 18 aircraft. Toward the end of the 1950’s, several local-service airlines needed to move beyond the piston airplanes that had faithfully and safely carried thousands of passengers to the more powerful and reliable turbo-props, and Allegheny Airlines was no exception. Above Copyright Photo: Bruce Drum/AirlinersGallery.com. A busy ramp scene at Philadelphia International Airport (PHL) as Convair 440-97 N8422H (msn 465) prepares to depart the gate. The propliner is painted in the 1965 livery with the slanted italic titles. Earlier, Convair Aircraft Corporation of San Diego had produced the popular Convair 340 and Convair 440 aircraft. Due to the arrival of the Lockheed Electra plus the Douglas DC-8 and Boeing 707 jet aircraft, several Convairs were being parked and stored in the deserts of California, Nevada, and Arizona. Above Copyright Photo: Christian Volpati Collection/AirlinersGallery.com. This rare photo shows the short-lived Napier-powered Convair 540 N440EL (msn 445) parked at the gate. The Napier Engine Company in England recognized this as an opportunity and immediately began work on converting the reciprocal piston engines to turbo-props for the Convair aircraft. Allegheny management quickly seized this opportunity and leased the aircraft now called the Convair 540 (above), which began service with the carrier on July 1, 1959. Allegheny leadership realized that the Convair 540 was the right choice for replacing the DC-3’s. The Convair 540’s were pressurized, a first for Allegheny, carried 44 passengers, flew faster, at greater attitudes, and had higher daily utilization than the DC-3’s and the Martin 202’s. Allegheny had decided that it was time to start retiring the DC-3’s and Martin 202’s as they were starting to show their age, so an aggressive program to acquire more Convair 340 and 440 aircraft was started with eventual plans to convert all aircraft to Convair 540 standards with the turbo-prop conversion. At the same time the Board of Directors for Allegheny decided to change the corporate logo from a “boomerang” to the “speed wedge” (above), which would stay with Allegheny well into the 1970’s. In addition the operations and maintenance base was moved from Washington National Airport in Washington D.C. to Pittsburgh. However, across the pond in England, Rolls Royce acquired Napier Engine Company. Immediately, Rolls Royce decided they would discontinue the conversion program after only seven aircraft had been delivered to Allegheny. This forced Allegheny to convert some of the Convair 540’s back to piston-driven Convair 340 or 440’s. At the same time Allegheny acquired additional Martin 202’s and Convair 440’s so that the DC-3’s could be phased out and removed from the fleet. Above Copyright Photo: Bruce Drum/AirlinersGallery.com. The Allison Convair 580 turboprop conversion is seen on N5845 (msn 52). In 1965, United States-based Allison Engine Corporation, which had been already providing turbo-prop engines for the Lockheed Electra and military C-130 aircraft, offered the power plant for retrofitting existing Convair airframes. Called the Convair 580, it had powerful four-blade turbo-prop engines that quickly shaved minutes off of the piston driven Convair 340 and 440’s. 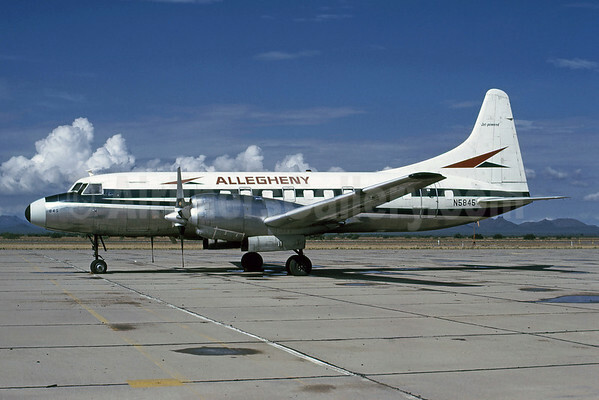 The Convair 580 captured the attention of Allegheny management in Pittsburgh. Without hesitation, Allegheny added this “new” turboprop to the fleet. Allegheny would eventually operate 44 Convair 580 “vistaliner” (above) aircraft. Above Copyright Photo: Ted J. Gibson/Bruce Drum Collection/AirlinersGallery.com. 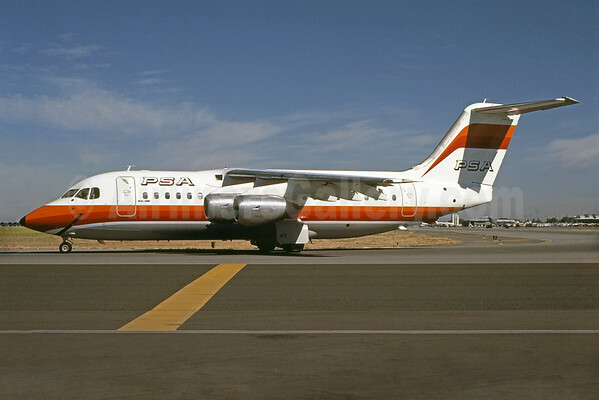 The Fairchild F-27J were relatively short-lived type with Allegheny Airlines. F-27J N2707J (msn 118) sits at Marana, AZ after its retirement. Later that same year, Allegheny also acquired the first of ten brand new Fairchild F-27J aircraft (above). With its Rolls Royce Dart turbo-prop-powered engines, high wing, and large oval windows, it was an instant hit with passengers and crews. With the introduction of the F-27 Allegheny started retiring the Martin 202 aircraft. Three Martin 202’s would be reconfigured to carry freight aircraft only. Above Copyright Photo: Bruce Drum/AirlinersGallery.com. The very first jetliner for Allegheny Airlines/USAir/US Airways was this leased Douglas DC-9-14 registered as N6140A (msn 47049). This rare photo shows N6140A ground-loading its passengers at Philadelphia bound for Hartford/Springfield and Providence. Allegheny Airlines knew that the jet age had arrived for local-service carriers. West Coast-based Bonanza Airlines needed to lease out a Douglas DC-9-14 aircraft (above) that had been recently delivered to them due to a downturn in traffic. Allegheny entered into a one-year lease agreement with Bonanza Airlines with the first Allegheny jet flight taking place on September 1, 1966. Above Copyright Photo: Christian Volpati Collection/AirlinersGallery.com. McDonnell Douglas DC-9-31 N969VJ (msn 47421) displays the updated 1966 livery introduced with the DC-9s. Allegheny would receive their first Douglas DC-9-31“vista-jets” in mid 1967 and immediately place the aircraft into service. This would be the first of more than 70 of the popular twinjet and the start of a long and positive relationship with Douglas and its successor McDonnell Douglas Aircraft Corporation. 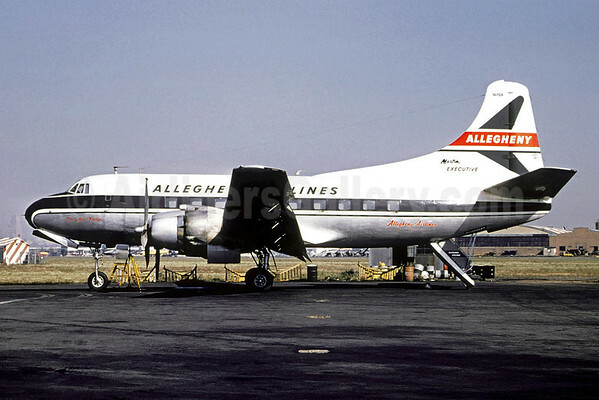 In September 1967, Allegheny retired the last of the piston powered Convair 440 aircraft. For the first time, Allegheny operated a pure turbo-prop and jet aircraft fleet, made up of Convair 580’s, Fairchild F-27’s, and Douglas DC-9’s. 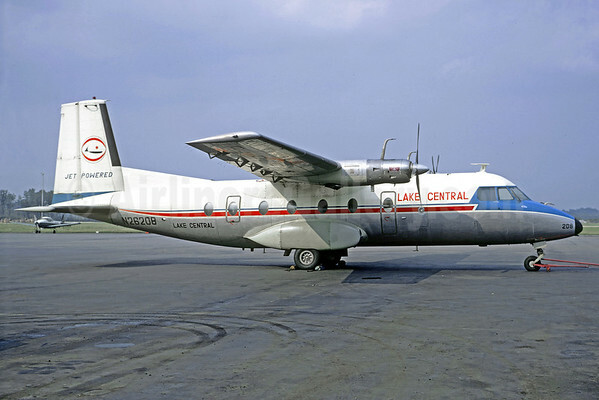 The first of what would be several mergers occurred on March 14, 1968, when the Civil Aeronautics Board approved the acquisition of Lake Central Airlines by Allegheny. Allegheny was able to further expand the route system and with the merger pick up important new cities in Indiana, Missouri, and Illinois. Above Copyright Photo: Jacques Guillem Collection/AirlinersGallery.com. French-built Nord 262A-44 N26203 (msn 11) is painted in the special “wine and cheese” livery. The airliner was also named “Nicole d’Allegheny” in concert with the French theme. The merger also brought more Convair 580’s, plus a new type of aircraft not previously flown by Allegheny called the Nord 262 aircraft (above). 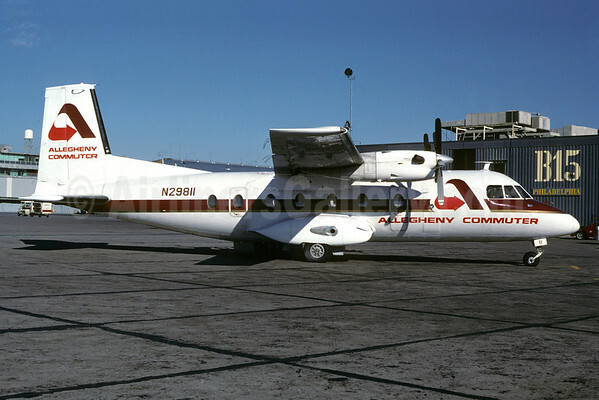 The twelve 29-seat French built Nord 262’s would become a huge headache for Allegheny Operations and Maintenance personnel, due to continuous issues with the Turbomeca Bastan turbo-prop engines that then proved to be very unreliable. Eventually Frakes Aviation in the United States would work to convert the engines to the much more reliable Pratt & Whitney PT-6 engines to finally solve the problem. At the same time the Nord 262 was renamed the Mohawk 298. 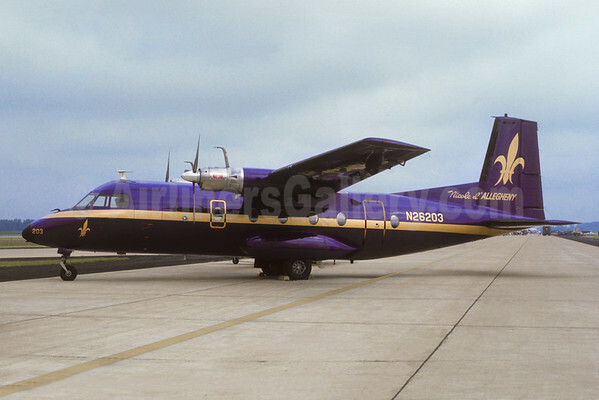 Allegheny made a bold experiment with Mohawk 298 aircraft by repainting nine of the twelve aircraft in a purple and gold paint scheme and naming them after flight attendants. The plan was to promote a business atmosphere with select wine and cheese on flights targeting the business community. While this did not last long it did prove to be very popular with passengers. 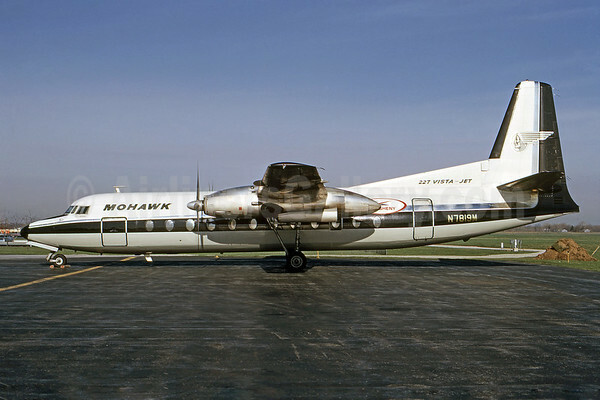 The Mohawk 298 would go on to faithfully serve Allegheny and the spin-off of the nations first organized commuter feeder to mainline airlines called Allegheny Commuter. Above Copyright Photo: Bruce Drum/AirlinersGallery.com. The Nord-converted Mohawk 298 N29811 (msn 42), operated as an Allegheny Commuter carrier by Ransome Airlines (Philadelphia), sits at the gate at Philadelphia. After the merger with Mohawk Airlines, and with the final phase-out of the Martin 202 aircraft, Allegheny found that several cities could not support the larger turbo-prop and jet aircraft due to either small populations or small airports. In 1967, with approval from the C.A.B. the Allegheny Commuter network was set-up. 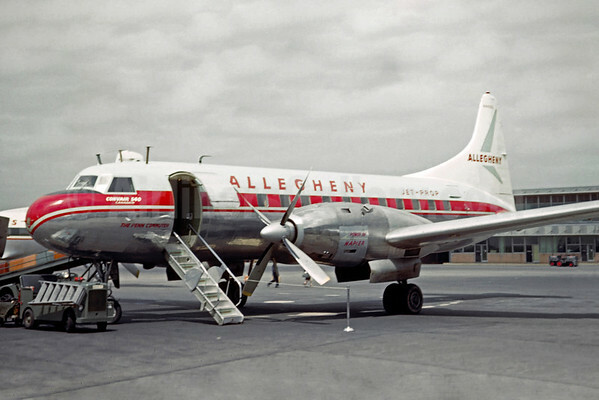 Allegheny Airlines set up marketing agreements with several small commuter airlines that included one-stop check in and seamless travel from the commuter network to mainline Allegheny flights. 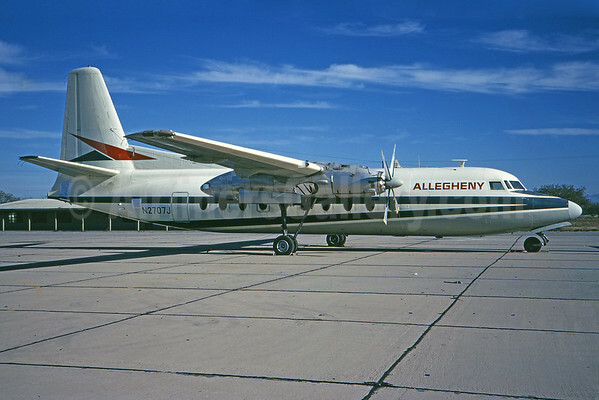 This included painting aircraft similar to Allegheny as well as providing advertising and marketing. Above Copyright Photo: Bruce Drum/AirlinersGallery.com. The Boeing 727-200s were operated on the higher-density routes such as Philadelphia-Pittsburgh. This rare photo shows Boeing 727-2B7 N751VJ (msn 20303) departing from Philadelphia. 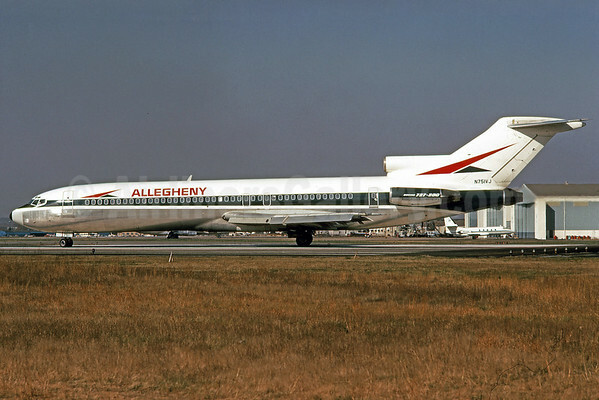 By mid 1970 Allegheny purchased two brand new Boeing 727-200 aircraft (above) to add capacity to the fleet. However, with the addition of a Flight Engineer, and the high cost of maintaining just two aircraft, Allegheny sold both aircraft to Braniff International as the home office had decided to stay with the twin jet DC-9 and found other airlines willing to lease their DC-9 series 30 aircraft at very reasonable lease rates. Above Copyright Photo: Bruce Drum/AirlinersGallery.com. BAC 1-11 204AF N1118J (msn 100) taxies at the former Syracuse, New York stronghold of Mohawk Airlines. The second merger with Mohawk Airlines was approved by the C.A.B. on April 12, 1972. In the merger Mohawk brought to Allegheny twenty-three BAC One Eleven’s (above) and seventeen Fairchild Hiller FH-227s. At the time Mohawk was in deep financial trouble and needed the merger to survive. 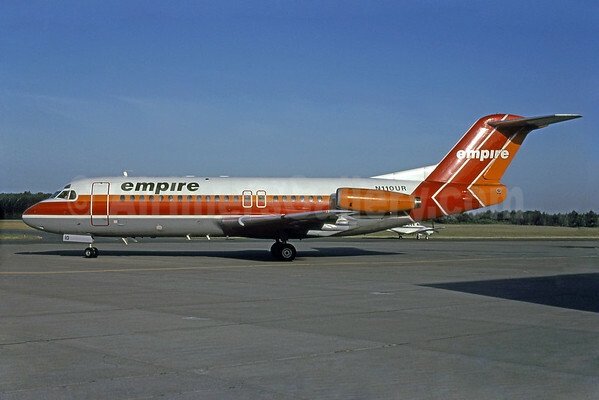 Shortly after the merger was approved, Allegheny purchased additional BAC One-Eleven aircraft from Braniff International, which was phasing out that aircraft type. 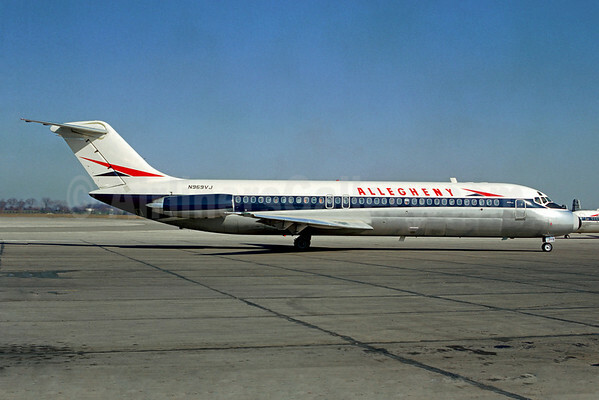 By late 1973, Allegheny had continued to grow to become the sixth largest airline. Allegheny leadership continued to aggressively pursue new route opportunities and had a constant presence in Washington D.C. to push for more cities to be added to Allegheny’s network. At the same time, Allegheny was able to purchase additional DC-9-32s from Delta Air Lines, which had earlier merged with Northeast Airlines. 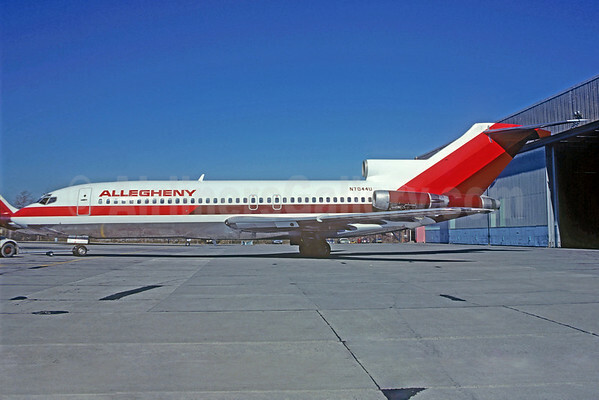 By 1974 Allegheny decided that a new paint scheme and rebranding was in order. The current paint scheme was worn out and dated. Gone was the speed-wedge and blue cheatline that had faithfully served Allegheny for over thirty years. The bold new paint scheme featured a large stripe that went from red at the nose to maroon by the tail, with a three-stripe tail in bright red, dark red, and maroon. At the same time, while other airlines were introducing First Class on their DC-9’s, Allegheny decided against it. 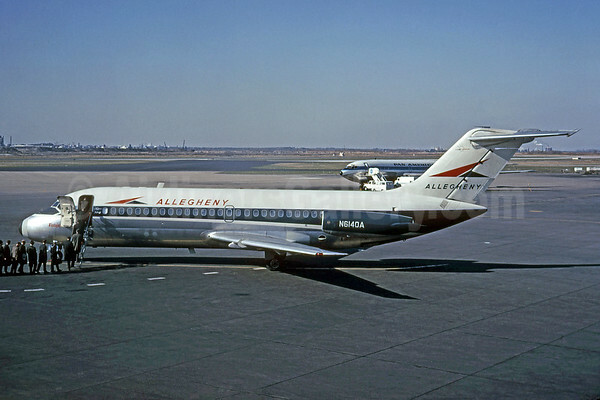 Instead, Allegheny used the “Custom Jet Class” to promote the all-coach configuration with new interiors that provided ample legroom with new seats, and overhead bins to give the aircraft a “wide-body” look. Above Copyright Photo: Elliot H. Greenman/Bruce Drum Collection/AirlinersGallery.com. Short-lived McDonnell Douglas DC-9-51 N923VJ (msn 47665) rests at the Pittsburgh International Airport maintenance base in the new 1975 livery. The new look premiered with a new aircraft type: the DC-9-51 aircraft in 1975. This new airplane provided more capacity, and kept costs down as it was simply a stretch of the DC-9-31 aircraft. Allegheny thought this would achieve the balance in higher density markets that had been tried five years earlier with Boeing 727-200’s. However, shortly after delivery of eight aircraft, the DC-9-51 was severely weight-restricted in several key Allegheny markets. What was originally thought would be a benefit was now another headache; reduced passenger capacity, and less ability to carry mail or airfreight made the aircraft too expensive for Allegheny’s needs. Allegheny and Eastern Airlines entered into an agreement to swap Allegheny’s DC-9-51’s for an equal amount of Eastern’s DC-9-31’s. The final transaction was completed in 1978. Also in 1978, Allegheny phased out the last Convair 580. While the Convair 580 continued to serve the airline well, a decision was made to have a pure jet fleet and have Allegheny Commuter continue to operate the 580’s. 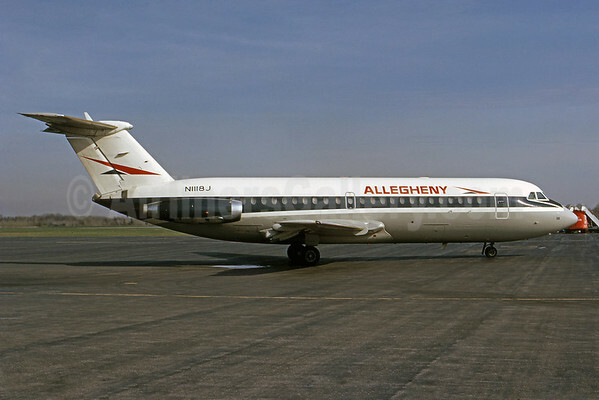 Allegheny was now a pure-jet airline flying BAC One- Eleven and DC-9-31/32 aircraft, with the exception of the 12 Mohawk 298’s. Allegheny continued to push the C.A.B. for more routes in the midwest and west. While frustration was mounting over lengthy hearings and long delays in being awarded new routes or raising airfares, the mood in Washington D.C. was changing. Airlines such as Texas International, Ozark, Piedmont, Hughes Airwest, and Allegheny called for the end of a regulated market, and lobbied heavily for full deregulation of the airline industry. In late 1977, President Jimmy Carter signed the “deregulation act,” which would forever change the industry. Allegheny no longer needed permission or approval to start or stop service and for the first time could set its own fare structure. As deregulation marched forward United Airlines starting parking older Boeing 727-100 aircraft. 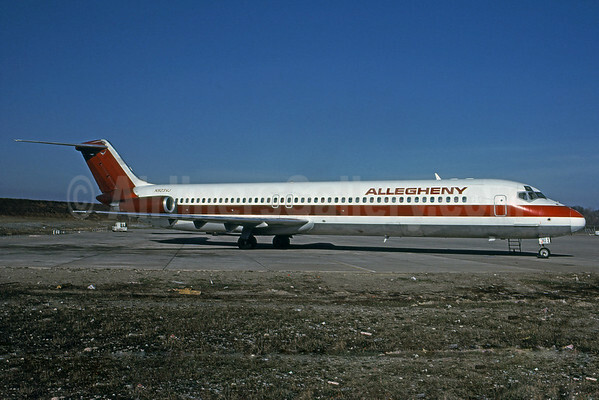 Allegheny acquired eleven of the popular tri-jet, while at the same time aggressively ordering additional DC-9-30’s from McDonnell Douglas and new 727-200s from Boeing. Above Copyright Photo: Christian Volpati Collection/AirlinersGallery.com. Ex-United Airlines Boeing 727-22 N7044U (msn 18851) is pictured at Pittsburgh. 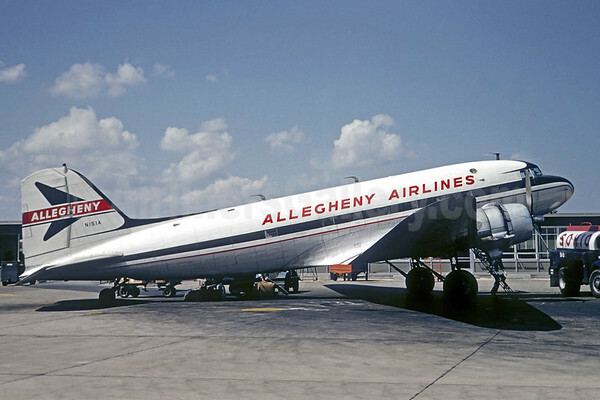 At the same time, then Chairman and President Ed Colodny decided the name Allegheny Airlines sounded too regional, especially with planned expansion to the west, which had been a long-time goal of Allegheny. After receiving board approval, Mr. Colodny announced to the world that Allegheny Airlines would become USAir on October 28, 1979. Above Copyright Photo: Christian Volpati Collection/AirlinersGallery.com. 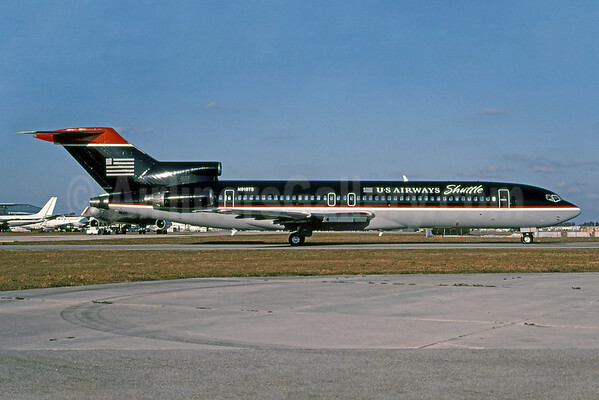 Initially the re-named USAir would operate under the 1975 Allegheny livery. 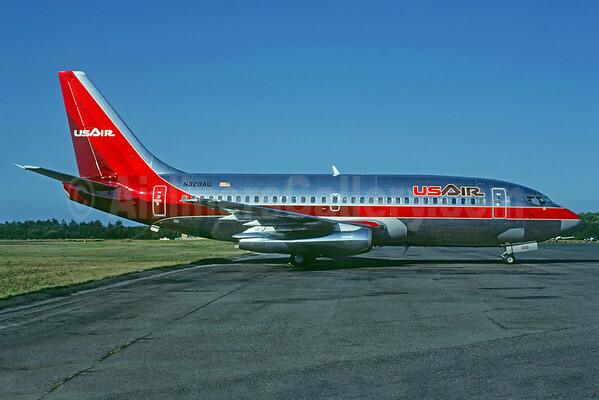 USAir (later US Airways) was a large Boeing 737 operator, operating the pictured 737-200 type along with the updated 737-300 and 737-400 models. The new USAir would retain the Allegheny paint scheme, and proudly have the new name placed on the upper forward fuselage and tail. 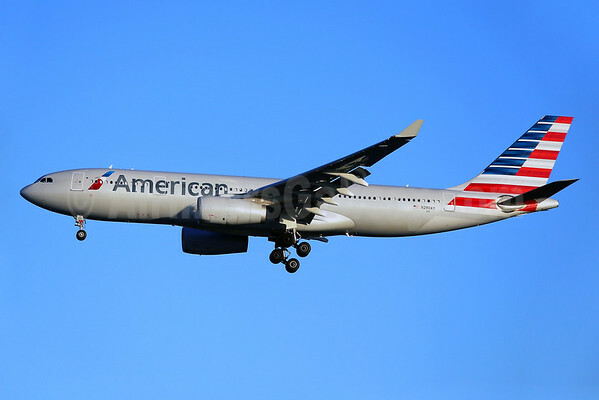 However, the white fuselage would give way to a polished aluminum aircraft, which would weigh less, and save money, a technique used successfully for many years at American Airlines. For USAir, this was just another chapter in the story of a great airline. This entry was posted in American Airlines, US Airways and tagged 1-11, 100, 1065, 11, 11182, 118, 1287, 13, 18851, 19689, 20303, 20445, 20959, 22881, 22888, 23234, 23553, 24764, 262A, 27805, 375, 42, 445, 465, 47049, 47421, 47665, 52, 542, 6035, 727, 727-100, 727-200, 727-214, 727-22, 727-225, 727-2B7, 737-200, 737-275, 737-2B7, 737-300, 737-301, 757, 757-200, 757-2B7, 767, 767-200, 767-2B7, 9142, 9471, A319, A320, A320-200, A320-214, A321, A321-200, A321-231, A330, A330-300, A330-323, Airbus, Airbus A319, Airbus A320, Airbus A321, Airbus A321-200, Airbus A330, Airbus A330-300, Allegheny Airlines, America West Airlines, American Airlines, BAC, BAC 1-11, BAC One Eleven, BAe, BAe 146, BAe 146-200, Boeing, Boeing 727, Boeing 727-100, Boeing 727-200, Boeing 737, Boeing 737-200, Boeing 737-300, Boeing 757, Boeing 757-200, Boeing 767, Boeing 767-200, C-47, C-GCPW, Charlotte, CLT, Convair, Convair 440, Convair 540, Convair 580, CV540, CV580, DC-3, DC-9, DC-9-14, DC-9-31, DC-9-51, Douglas, Douglas DC-3, Douglas DC-9, Douglas DC-9-14, Douglas DC-9-31, E2024, empire airlines, F-27J, F.27, Fairchild, Fairchild F-27J, Fairchild Hiller, Fairchild-Hiller FH-227, FH-227, FH-227B, Fokker, Fokker F.28, Fokker F.28 Mk. 4000, Lake Central Airlines, LAS, Las Vegas, M202, M298, Martin, Martin 202, MetroJet, Mohawk 298, N106US, N109UW, N110UR, N1118J, N151A, N172A, N262, N26203, N26208, N269AU, N2707J, N276AY, N29811, N316P, N320AU, N348PS, N350US, N440EL, N578UW, N5845, N6140A, N651US, N7044U, N744P, N751VJ, N7819M, N8422H, N911TS, N918TS, N923VJ, N940UW, N969VJ, Napier, Nord, Nord 262, Nord 262A, One Eleven, Pacific Southwest Airlines, Philadelphia, PHL, Piedmont Airlines (1st), PSA, San Jose, SJC, SYR, Syracuse, Trump Shuttle, US Airways, USAir on August 24, 2015 by Bruce Drum. 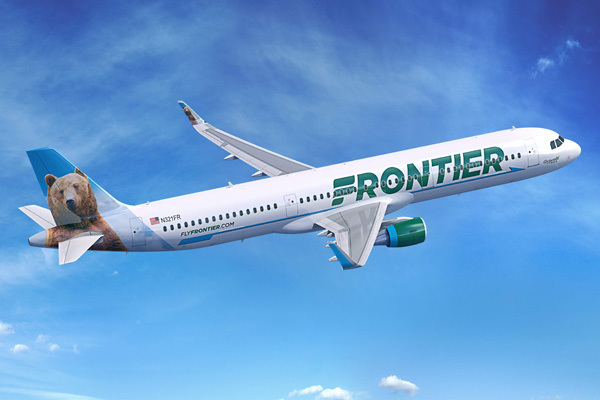 Frontier Airlines (2nd) (Denver) is planning to introduce the new Airbus A321-200 on November 1 on the Orlando – Philadelphia route with two daily roundtrips per Airline Route. The Orlando – Cleveland route will be added on November 4. 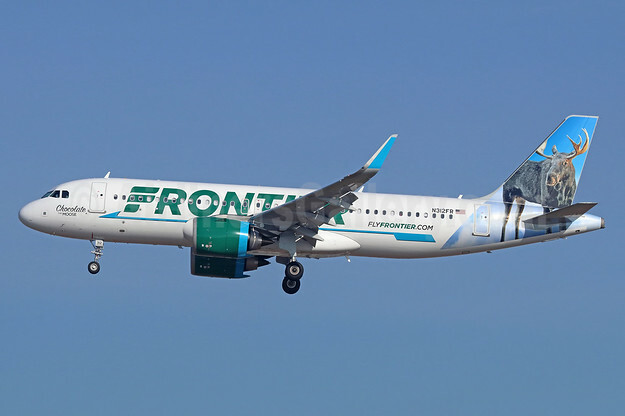 Frontier has 19 A321s on order. This entry was posted in Frontier Airlines (2nd) and tagged A321, A321-200, Airbus, Airbus A321, Airbus A321-200, Cleveland, Frontier Airlines, Orlando, Philadelphia on August 3, 2015 by Bruce Drum. Qatar Airways (Doha) has announced that Philadelphia will be the first destination it will fly to in the USA using the new Airbus A350-900. Qatar Airways plans to begin operating an A350-900 on its daily service from Doha’s Hamad International Airport to Philadelphia International Airport from January 1, 2016. The date will coincide with the launch of services to Los Angeles, one of three new Qatar Airways destinations in the US for 2016. Starting on March 1, 2016 and March 16, 2016, the A350-900 will also fly on one daily flight to New York (JFK) and also to Boston; meaning three of Qatar Airways’ US destinations will all be served by the A350-900. The introduction of the state-of-the-art A350 on the daily flights between Doha and Philadelphia brings an additional capacity of more than 9% compared to the Boeing 777-200 LR which is being operated on the route. Qatar Airways’ daily capacity to Philadelphia will grow from 259 seats on the Boeing 777-200 LR to 283 seats on the A350-900 aircraft. Qatar Airways’ A350-900s feature 36 seats in Business Class in a 1-2-1 configuration, featuring 80” inch fully flat horizontal beds, and a 247 seating capacity in Economy Class in a 3-3-3 layout. All seats in Business Class have direct aisle access with 17” HD in-flight entertainment screens. Economy Class features 10.6” in-flight entertainment screens and more space for passengers in window seats, thanks to a vertical side wall panel design. 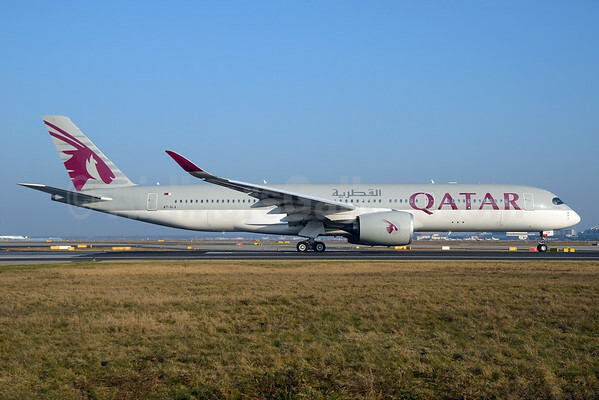 Qatar Airways now operates 47 passenger flights a week between the United States and Doha – daily from New York, Washington (Dulles) DC, Chicago (O’Hare), Houston (Bush Intercontinental), Philadelphia, Dallas/ Fort Worth, and five flights a week from Miami. In addition to this, over the next few months, Qatar Airways’ US network will grow further with new routes Los Angeles January 1, 2016), Boston (March 16, 2016), Atlanta (July 1, 2016) and a second daily flight to New York from March 1, 2016. Copyright Photo: Bernhard Ross/AirlinersGallery.com. Pictured in action at the first destination of Frankfurt is the first copy, Airbus A350-941 A7-ALA (msn 006). This entry was posted in Qatar Airways and tagged 006, 87A748, A350, A350-900, A350-900 XWB, A350-941, Airbus, Airbus A350, Airbus A350-900, FRA, Frankfurt, Philadelphia, Qatar Airways on June 1, 2015 by Bruce Drum.